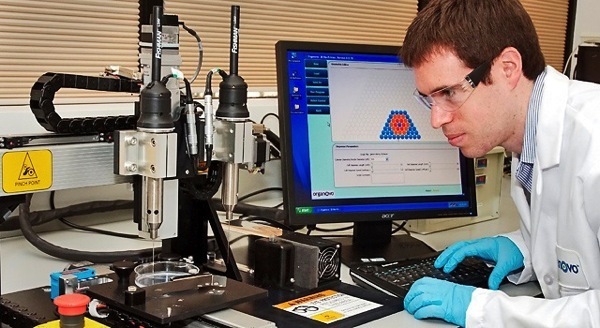 Organovo Achieves One Month Performance, Drug Responsiveness for 3D Bioprinted Liver Tissues #3DThursday #3DPrinting « Adafruit Industries – Makers, hackers, artists, designers and engineers! Building on data first presented at the Experimental Biology conference in April 2013, the company presented data demonstrating retention of key liver functions in bioprinted tissues for up to 40 days, longer than one month. Additional data presented at the Cell Therapy Bioprocessing Conference demonstrated that Organovo’s 3D liver tissues exhibit dose-dependent responses to acetaminophen, a known liver toxicant, and that the toxic effects can be assessed using both standard screening assays and histopathological assessment of the treated tissue. The data demonstrate that Organovo’s 3D Liver tissue can potentially have value in assessing toxicology problems in human liver over a long period, including sub-acute and multiple dose effects. The demonstration of extended function in Organovo’s 3D liver tissues was achieved faster than Organovo’s projected timeline of achieving these results by the end of 2013 and highlights progress in the development of a 3D Human Liver product, which is on track for launch in 2014. The company believes that a multi-cellular bioprinted 3D Liver system with extended life span in culture can provide superior results to current human cellular models and offer significant value to pharmaceutical researchers by enabling assessment of both biochemical and tissue responses….